TCS opens with 37 students, 5 teachers grades 1-4. Situated in the old Russian Orthodox school buildings built in 1889, making the buildings more than 100 years old. Buildings were renovated by American Missionaries and school furniture donated by churches in East Texas area. Years 1996-2000 TCS added an additional grade each year until it reached a primary school. Grades 1-9. in May 2001 TCS graduated their first 9th grade students, who were in 4th grade when TCS was founded in 1995. Upon the request of students and parents in the 9th grade, TCS Leadership felt the Lord was leading them to continue adding grades to establish a Christian Highschool. In 2004 TCS graduated their first Senior class. 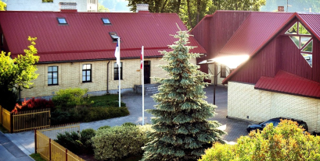 TCS has been the only school in Talsi which has experienced a substantial student growth of 54% from 2004, while the population in the city has decline by 25%. 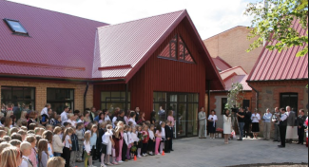 In 1999 TCS completed its first capital campaign project, opening the first handicap accessible Christian school in all of western Latvia. The building was named after a TCS student who died in a tragic accident during a city festival. TCS has outgrown it’s facilities and we are blessed to be in a Capital Campaign to expand our education and ministry borders. In 2005 TCS completed its second capital campaign project, including a handicap accessible gym. This expansion put TCS in a position of student growth, evidenced by the 54% increase in the last 10 years.